With bird control services, you will manage to scare away birds from your property. However, it might not be enough to remove these birds which cause nuisance. Chances are you will be left with a huge mess, especially with bird dropping, nesting materials and feathers. The droppings could be on everything on your property, including fences, rooftops, pavement and other areas. Considering how stinky they can get and the fact that they could contain ectoparasites, it is important to remove them effectively you will find a great leaving your property clean and sanitary. Without the right tools and techniques, it can be hard for you to remove the droppings effectively. Why Hire Dropping Removal Services? 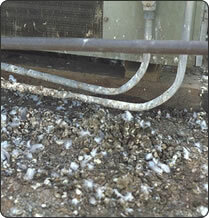 Bird dropping removal services can save you from having to deal with the bird mess on your property. Toro waste specialists are more than willing to help you deal with the mess in no time at all. When working with Toro Pest Management, you will enjoy dropping removal services as part of bird management project. We are dedicated to leaving your property as clean and sanitary as possible; hence we will make sure we offer dropping removal services after removing birds from your property. Toro uses waste cleanup systems in preparing proper conditions for the effective removal of all potential health hazards that have been left by birds. We will remove eggs, nesting materials, and feathers as we clean the droppings. Toro has bird specialists who are trained and qualified in waste removal. Bird dropping services done by our professionals ensure that even hard to reach places are reached and cleaned thoroughly. If you were to do the cleaning alone, there are areas you wouldn’t find easy to access. With our tools and equipment, we will have an easy time accessing such areas on your property to get rid of the mess left behind. Our company has been in operation for years. We understand pest behavior and therefore know the right techniques to use in eradicating them effectively. Over the years we have gone through training and we have come up with pest control programs to suit any kind of need. We keep up with the latest solutions; hence you can be sure we know the right products to use on your pests for effective results. Apart from using the right products, we are also knowledgeable on pest handling techniques. It puts us in a position where we don’t risk your life or ours during the control program. Toro Pest Management controls all kinds of insects and pests, including birds, rats, ants and mice among others. We strive to make customer experiences as pleasant as possible by responding rapidly to requests. In most cases, we offer free evaluation of your property before giving you our recommendations. As soon as you give us the go ahead, we will start working on your project in the best ways possible to fetch you expected results within a reasonable period of time.